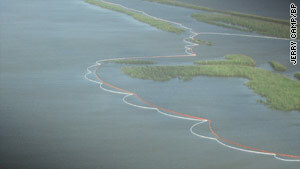 BP laid 6,500 feet of booms around the Delta National Wildlife Refuge on Saturday to minimize the effects of the oil spill. (CNN) -- A federal official monitoring the environmental impact of the massive oil spill in the Gulf of Mexico said Tuesday his agency is closely watching what he called BP's "unique idea" to break up the spill with dispersant chemicals underwater. In addition to the traditional method of using dispersants on the surface, BP has attempted to inject chemicals near the source of the leak deep underwater. Oil has been gushing out of the seabed since at least April 22, when the Deepwater Horizon sank two days after an explosion and fire. Charlie Henry, scientific support coordinator with the National Oceanic and Atmospheric Administration, told reporters Tuesday that the agency is evaluating the pros and cons of the effort. "We're looking at response options, from the perspective of trying to make a determination of what makes the biggest mitigation to the pollution threat." "This is a unique idea, to insert dispersants near the seafloor," said Henry. "There are a lot of unknowns associated with this." So-called dispersants have components that bond to oil molecules, separating them from water molecules and helping break up the spill. 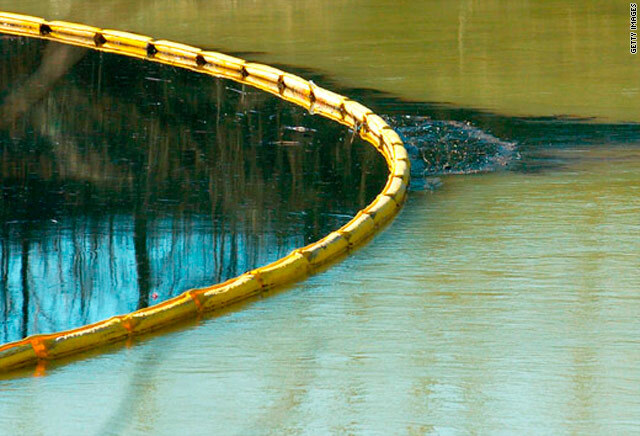 The Nalco Holding Co., based in Naperville, Illinois, said that BP is using its Corexit 9500 product in the Gulf. Nalco describes itself as the world's leading water treatment and process improvement company. "We've made available to BP and the Coast Guard what we have in stock, and we are manufacturing more as it's needed," spokesman John Shane said Tuesday. Shane said he could not discuss the exact chemical makeup of Corexit 9500, in part because the formula is a trade secret. The material data safety sheet for Corexit 9500 said it includes petroleum distillates, propylene glycol and a proprietary organic sulfonic salt. According to the safety sheet, it can cause eye or skin irritation with prolonged contact. It also warns that "repeated or prolonged exposure may irritate the respiratory tract." Henry said the dispersants being used in the Gulf show "fairly low toxicity." He added that any dispersant must be preapproved by the Environmental Protection Agency and listed on an approved product schedule before its use. A 2005 report by the National Research Council found that Corexit is "significantly less toxic than oil or dispersed oil," based on numerous studies. Nalco describes the product as biodegradable. "It's made up of products that are used in everyday life, products used in food and products used in cosmetic applications as well," Shane said. Toxicologists and environmental scientists said Corexit and other dispersants are unlikely to cause immediate harm to people, but can have a big impact on marine organisms that are directly exposed. A report by scientists at Exxon Biomedical Sciences said an earlier version of Corexit is harmful to some marine organisms at even lower doses than oil itself. Fish eggs and larvae, shrimp, coral and oysters are potentially most at risk. The National Research Council report noted elevated concentrations of dispersant chemicals in shellfish after a spill in Coos Bay, Oregon. The chemicals can also contaminate the skin of ocean-farmed fish if their cages are near the site of the spill, according to the International Tanker Owners Pollution Federation, a nonprofit that offers technical guidance on cleaning up spills. Jackie Savitz, senior scientist with Oceana, an environmental group that opposes offshore drilling, said the use of dispersants may be warranted, but that chemicals only shift the environmental impact, rather than eliminate it. "[Dispersants] make the oil more soluble in water, so it won't just sit on the surface," said Savitz. "Whether that's good or bad depends on whether you're a fish or a seabird." Breaking up the oil may prevent it from forming clumps and coating birds' feathers, but causes droplets to spread more widely at various depths. "It's like if your kids spread the food around on their plate. It looks as though there's less food, like they ate it, but really they just moved the food around." CNN's Trisha Henry contributed to this report.